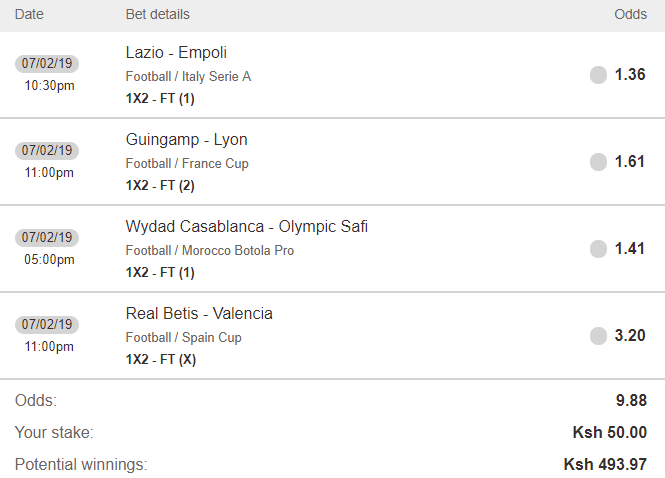 Futaa's risky multiple bet for tonight returns ten times your stake! We've taken our chances on a risky multiple bet tonight on betPawa and if all four results are correct, we return ten times our original stake! Lazio is has kept a clean sheet in their last four home matches against Empoli across all competitions, and there have been over 2.5 goals scored in 13 of Empoli's last 14 matches. Lazio has won their last four matches against Empoli across all competitions. Lyon won 4-2 away to Guingamp this season in Ligue 1, and has won the last two competitive matches between the sides. Wydad Casablanca is undefeated in eleven of their last twelve Morocco Botola Pro matches. Two of the last four meetings between these sides have ended as goalless draws. Follow the Copa Del Rey live on Futaa!